Context: Prayagraj Kumbh Mela 2019, a religious fair that will be held from January 15, 2019 to March 4, 2019. The Kumbh Mela (the festival of the sacred pitcher) is anchored in Hindu mythology. It is the largest public gathering and collective act of faith, anywhere in the world. The Mela draws tens of millions of pilgrims over the course of approximately 55 auspicious days to bathe at the sacred confluence of the Ganga, the Yamuna, and the mystical Sarasvati. Primarily, this congregation includes Ascetics, Saints, Sadhus, Sadhvis, Kalpvasis, and Pilgrims from all walks of life. Important Geophysical phenomena such as earthquakes, Tsunami, Volcanic activity, cyclone etc., geographical features and their location. For Prelims: About Mount Soputan, pacific ring of fire and key geographical locations. For Mains: Volcanic eruptions- causes, effects and management. Why in News? One of the most active volcanoes of Indonesia, Mount Soputan volcano, erupted recently. It is located on the Sulawesi island in Indonesia. Background: Indonesia sit along the Ring of Fire region, an area where most of the world’s volcanic eruptions occur. The Ring of Fire has seen a large amount of activity in recent days, but Indonesia has been hit hard due to its position on a large grid of tectonic plates. 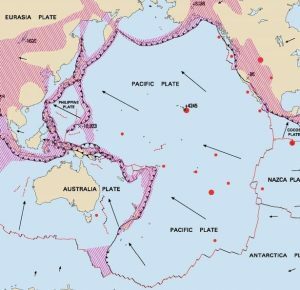 Vulnerable: Indonesia is at the meeting point of three major continental plates – the Pacific, the Eurasian and the Indo-Australian plates – and the much smaller Philippine plate. As a result, several volcanoes on the Indonesian islands are prone to erupting, with Bali’s Mt Agung taking the headlines last year and in 2018. Indonesia is home to roughly 400 volcanoes, out of which 127 are currently active, accounting for about a third of the world’s active volcanoes. Around 90% of the world’s earthquakes occur in the Ring of Fire, and 80% of the world’s largest earthquakes. The 40,0000 kilometre horse-shoe-shaped ring loops from New Zealand to Chile, passing through the coasts of Asia and the Americas on the way. How was the Ring of Fire formed? 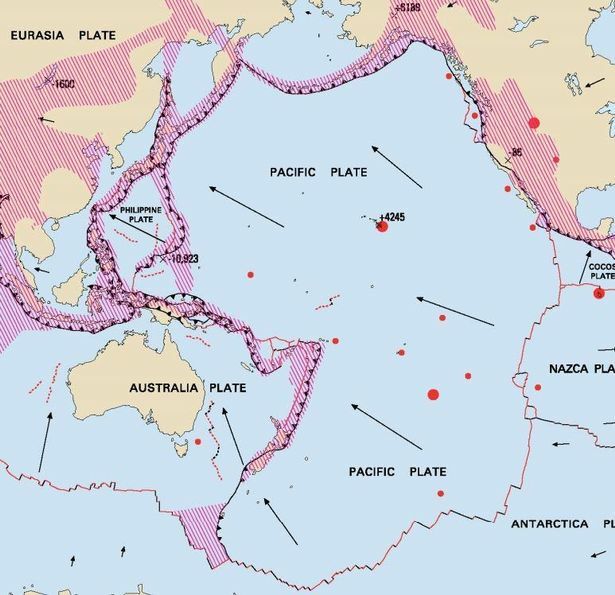 Why does the Ring of Fire trigger earthquakes? Mains Question: The greatest concentration of volcanoes is located in the Circum – Pacific region, known as ‘Pacific Ring of Fire’. Examine why and also explain features of these volcanoes. For Prelims: Key features of 7th schedule and about concurrent list. For Mains: Demand for removal of concurrent list- concerns, need of the hour. Context: Telangana TRS chief K Chandrasekhar Rao has called for an economic and political overhaul in India. KCR’s pitch, like that of many regional leaders, is an increase in state autonomy by weakening the concurrent list. Emphasising the need to decentralise power, KCR has said- The autonomy of states should increase. The Concurrent List should be weakened. There should be a clear division. Subjects which are under the Centre must be transferred to the state. The Concurrent List includes subjects that give powers to both the Centre and state governments. Subjects like Education including technical education, medical education and universities, population control and family planning, criminal law, prevention of cruelty to animals, protection of wildlife and animals, forests etc. However, given that there can be conflict when it comes to laws passed by Parliament and state legislatures on the same subject, the Constitution provides for a central law to override a state law. Since 1950, the Seventh Schedule of the Constitution has seen a number of amendments. The Union List and Concurrent List have grown while subjects under the State List have gradually reduced. The 42nd Amendment Act was perhaps one of the most controversial. Effected in 1976 during the Emergency by then Prime Minister Indira Gandhi, the amendment restructured the Seventh Schedule ensuring that State List subjects like education, forest, protection of wild animals and birds, administration of justice, and weights and measurements were transferred to the Concurrent List. Taking his idea forward, the Tamil Nadu government under M Karunanidhi constituted the PV Rajamannar Committee to look into Centre-State relations. While the Committee submitted its reports in 1971, the Tamil Nadu Legislative Assembly adopted a resolution three years later demanding that the Centre accept the state’s views on state autonomy and the recommendations of the Rajamannar Committee. The Rajamannar Committee spurred other states to voice their opposition to the Centre’s encroachment on subjects that were historically under the state’s purview. PM Indira Gandhi had constituted the Sarkaria Commission to look into Centre-State relations. However, the recommendations of the Sarkaria Commission were not implemented by successive central governments. Mains Question: Examine whether Article 246 is the cornerstone of centre state legislative relations? Discuss whether Concurrent list created confusion with respect to extent of legislative power of centre and states? For Prelims: About Asbestos and its use. For Mains: Concerns over its use and need for a blanket ban. Context: over 12,000 women in the US have sued Johnson & Johnson over claims that the talcum powder manufactured by them is the prime cause behind their ovarian cancer. A recent investigation by Reuters claimed that the talcum powder was contaminated by carcinogenic asbestos, making it poisonous and life-threatening for women using it on themselves. What is talc, and why is asbestos relevant? Asbestos is a set of six naturally occurring silicate minerals, which all have in common their eponymous asbestiform habit: i.e., long (roughly 1:20 aspect ratio), thin fibrous crystals, with each visible fiber composed of millions of microscopic “fibrils” that can be released by abrasion and other processes. They are commonly known by their colors, as blue asbestos, brown asbestos, white asbestos, and green asbestos. When asbestos is used for its resistance to fire or heat, the fibers are often mixed with cement or woven into fabric or mats. These desirable properties led to asbestos being used very widely. Inhalation of asbestos fibers can cause serious and fatal illnesses including lung cancer, mesothelioma, and asbestosis (a type of pneumoconiosis). For Prelims: About Paris Climate Deal, COP24 and its outcomes. For Mains: Outcomes and significance of the recent COP24 and the need for framework to achieve Paris Climate targets. What was agreed at COP24? Countries settled on most of the tricky elements of the “rulebook” for putting the 2015 Paris agreement into practice. This includes how governments will measure, report on and verify their emissions-cutting efforts, a key element because it ensures all countries are held to proper standards and will find it harder to wriggle out of their commitments. This global deal is meant for climate actions by all the countries across the globe post-2020. Besides transparency framework, the Katowice package also includes guidelines that relate to the process for establishing new targets on finance from 2025 onwards to follow-on from the current target of mobilizing $100 billion per year from 2020 to support developing countries. It also includes how to conduct the Global Stocktake (GST) of the effectiveness of climate action in 2023 and how to assess progress on the development and transfer of technology. The global rules are important to ensure that each tonne of emissions released into the atmosphere is accounted for. In this way, progress towards the emission limitation goals of the Paris Agreement can be accurately measured. Currently, climate actions of rich nations for pre-2020 period are being guided by the Kyoto Protocol. There was a row over carbon credits, which are awarded to countries for their emissions-cutting efforts and their carbon sinks, such as forests, which absorb carbon. These credits count towards countries’ emissions-cutting targets. Brazil, which hopes to benefit from its large rainforest cover, insisted on a new form of wording that critics said would allow double counting of credits, undermining the integrity of the system. This issue has been put off until next year. Largely absent from these talks, which had a technical focus, was the key question of how countries will step up their targets on cutting emissions. On current targets, the world is set for 3C of warming from pre-industrial levels, which scientists say would be disastrous, resulting in droughts, floods, sea level rises and the decline of agricultural productivity. When will that be agreed? The key deadline is 2020, when countries must show they have met targets set a decade ago for cutting their emissions, and when they must affirm new, much tougher targets. The Intergovernmental Panel on Climate Change (IPCC), the global body of the world’s leading climate scientists, warned two months ago that allowing warming to reach 1.5C above pre-industrial levels would have grave consequences, including the die-off of coral reefs and devastation of many species. If we extrapolate from the IPCC’s findings, the world has little more than a decade to bring emissions under control and halve them, which would help to stabilise the climate. After years in which the world’s carbon emissions appeared to be stabilising, they are on the rise again. Coal use continues and oil is still the engine of much of the world’s economy. Clean energy is coming on-stream at a faster rate than many predicted, and the costs of it have come down rapidly, but its adoption needs to be speeded up. Infrastructure, such as energy generation plants, transport networks and buildings, is a central issue: infrastructure built now to rely on high-carbon energy effectively locks in high emissions for decades to come. Some people are also saying we need to invest in projects to remove carbon from the atmosphere. The UN will meet again next year in Chile to thrash out the final elements of the Paris rulebook and begin work on future emissions targets. But the crunch conference will come in 2020, when countries must meet the deadline for their current emissions commitments and produce new targets for 2030 and beyond that go further towards meeting scientific advice. That conference may be held in the UK or Italy, both of which have bid to be hosts. The UK’s intention in offering to host is to signal it will retain its role on the world stage after Brexit. The event may also provide a welcome change from wranglings over Brexit and intractable trade deals. Mains Question: The Rule book agreed to in COP 24, is not ambitious enough to prevent the dangerous effects of global warming. Critically analyze. In the context of establishing quality residential schools for the promotion of education, Eklavya Model Residential Schools (EMRSs) for ST students are set up in States/UTs with provisioning of funds through “Grants under Article 275(1) of the Constitution”. The establishing of EMRSs is based on demand of the concerned States/UTs with availability of land as an essential attribute. As per the budget 2018-19, every block with more than 50% ST population and at least 20,000 tribal persons will have an Eklavya Model Residential School by 2022. What is Eklavya Model Residential School (EMRS)? EMRS is a Government of India scheme for model residential school for Indian tribals (Scheduled Tribes, ST) across India. Comprehensive physical, mental and socially relevant development of all students enrolled in each and every EMRS. Students will be empowered to be change agent, beginning in their school, in their homes, in their village and finally in a larger context. Support the annual running expenses in a manner that offers reasonable remuneration to the staff and upkeep of the facilities. Support the construction of infrastructure that provides education, physical, environmental and cultural needs of student life. The Government has approved “Revitalizing Infrastructure and Systems in Education by 2022”, accordingly the scope of institutions to be funded through Higher Education Financing Agency (HEFA) has been enlarged to encompass School Education and Medical Education institutions, apart from Higher Education. 1500 research projects will be awarded for 2 years to support the social science research in the higher educational and to enable research to guide policy making. To provide opportunity for social science researchers in any institution in the country, including all Universities (Centre and State), private institutions with 12(B) status conferred by UGC. Higher Education Financing Agency (HEFA) is a joint venture of MHRD Government of India and Canara Bank with an agreed equity participation in the ratio of 91% and 9% respectively. It is for financing creation of capital assets in premier educational institutions in India as part of rising 2022. HEFA’s scope is greatly expanded to cover school education, educational institutes under Ministry of Health, etc. The ‘Adopt A Heritage: Apni Dharohar, Apni Pehchaan’, scheme launched on 27th September, 2017. The aim of the project is to provide basic amenities that include cleanliness, public conveniences, safe drinking water, ease of access for tourists, signages, illumination, Wi-fi etc. The project envisages involvement of Private/Public Companies/Organizations and Individuals to adopt Monuments, Natural Heritage Sites and other Tourist Sites, primarily under CSR. No fund is given by Ministry of Tourism. Archaeological Survey of India has identified 100 monuments as “Adarsh Smarak” for upgradation of existing facilities/amenities like Wi-Fi, cafeteria, interpretation centre, brail signage, modern toilets etc. The Archaeological Survey of India (ASI), under Ministry of Culture, is the premier organization for the archaeological researches and protection of the cultural heritage of the nation. The prime objective is maintenance of ancient monuments and archaeological sites and remains of national importance. It regulates all archaeological activities in the country as per the provisions of the Ancient Monuments and Archaeological Sites and Remains Act, 1958 along with the Antiquities and Art Treasure Act, 1972. Mains Question: Discuss the mandate, organizational structure and functioning of Archaeological Survey of India (ASI). Context: Salome Zurabishvili is Georgia’s first female president. With this, the country has transformed itself into a parliamentary republic with a largely ceremonial president. It is a country in the Caucasus region of Eurasia. Located at the crossroads of Western Asia and Eastern Europe, it is bounded to the west by the Black Sea, to the north by Russia, to the south by Turkey and Armenia, and to the southeast by Azerbaijan.